Using navigation is simple and convenient when you configure your system so that it works best for you. As your preferences change, simply change settings to reflect your current needs. Customisation is designed to be intuitive, so making adjustments is easy and convenient. It is important that you look at the display only when it is safe to do so. If you are the driver of the vehicle, we recommend that you operate your navigation system before you start your journey. Plan the route before your departure, obey all traffic signs, and stop if you need to change the route. 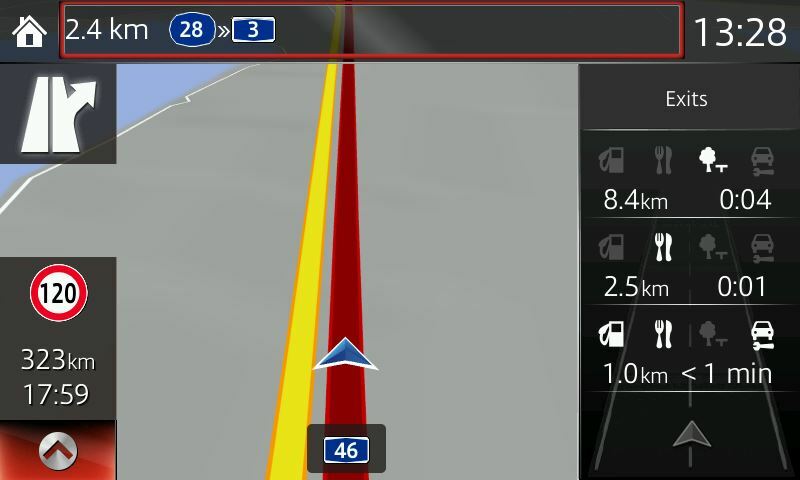 If you deviate from the recommended route, your navigation system automatically adjusts. Options include: colour themes for both day and night use; selecting which places should appear on map; choice of 3D perspective or top-down view; and showing or suppressing 3D city models, 3D artistic or block representation of full city building data. Activate specific warnings and alerts; adjust volume; set up warnings related to speed limit and monitoring current speed; set notifications of road safety cameras and other proximity alert points. The recommended route between two points may not always be the same because traffic can vary according to day of the week, time of day and season. Taking historical traffic data and patterns into account, when available, makes it possible for your system to calculate the most efficient route to any destination. You may choose to enable this option during normal conditions and disable it during holidays or other times when historical patterns may not apply. Select TRAFFIC SETTINGS to enable or disable use of traffic or detour information. Change the planning method to optimise route calculation for specific situations and vehicle types. You may also prefer to avoid certain types of routes, such as toll roads or ferries. Exclude a particular road type to have the system calculate a route that avoids these roads whenever possible. The navigation system helps you find your way to your destination with the built-in GPS receiver, however, the Mazda navigation system does not transmit your GPS position and others cannot track you. When first using the application, you have the opportunity to accept collection of usage information and GPS logs that may be used for improving the application and the quality and coverage of maps. The data is processed anonymously; no one will be able to track any personal information.